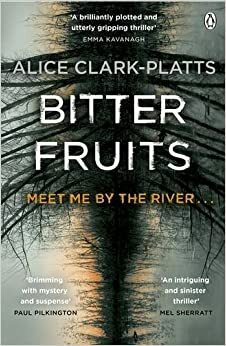 Bitter Fruits, a psychological crime thriller, is set in the UK university town of Durham. The murder of a first-year student shocks the city. The victim, Emily Brabents, was from the privileged and popular set at Joyce College, a cradle for the country’s future elite. As Detective Inspector Erica Martin investigates the college, she finds a close-knit community of secrets, jealousy and obsession. But the very last thing she expects is an instant confession…The picture of Emily that begins to emerge is that of a girl wanted by everyone, but not truly known by anyone. I asked Alice a few questions about setting up shop as a professional author, writing for the international market, from Asia. How easy or difficult is it to manage a career as in internationally published author from Asia? Well, given I've never managed it from anywhere else, I find it very easy! Communications between countries these days are very easy and so there's never been an issue. The only potential problem is time differences but given I'm 7 hours ahead of London in Singapore, it actually feels like I'm ahead of the game! How easy / difficult was it to work with your structural editor? This was the part of the process of which I was most terrified! But actually, all his suggestions were spot on and fairly simple to implement. I had been working on the novel for so long by that time, that I could almost read it to you blind fold! So I knew the characters very well and the plot was burnt into my brain. It made re-writing a lot easier than the original writing! How easy / difficult was it to work with your copy editor? He was amazing! The research he did from subjects ranging from times of sundown to spires on cathedrals was very awe-inspiring. I pretty much accepted all of his changes and thank him very much! What about marketing? Isn't it difficult to help out from Asia? Penguin Random House have an office in Singapore so it was fairly easy to liaise with them regarding publicity and marketing. I was able to do interviews via email and Skype. As luck would have it, I travel back to the UK with my children for the summer, so I’m here for publication, and happy to be on hand for publicity purposes. Did you feel isolated from the publishing process? No, not at all. Even if I'd lived in London, I doubt I would have been in the Penguin office overseeing the copy edits! I've been very involved with every step - from large edits, to proof copies, choosing a title and the cover. I've felt very involved via email and Skype at every step of the process. Do you feel isolated from international networks of crime writers? These days, social media is so important. I'm in touch with lots of other writers via Facebook and Twitter. It's not isolating in the slightest being in Asia. Sometimes, there's almost too much contact which distracts me from writing! Why would readers in Asia enjoy a crime novel set in Durham? The location of Durham doesn't impact on an enjoyment of a good who dunnit! Whilst those who know the city will enjoy some of the descriptions, Asian readers will learn about an English university and also have the pleasure of a gripping thriller! What advice do you have for would-be authors in Asia? Asia is a bubbling hub at the moment for literary festivals and creative writing events. Go along to things and network. And have the confidence to believe in your writing - keep at it! Is there anything you want to say to potential readers in Asia? I hope they enjoy Bitter Fruits and I'm looking forward to receiving their feedback, and seeing them at events in and around the region.